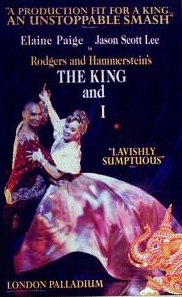 A few weeks ago I was alerted to a promotion on amazon that offered a digital download of the 2000 London Cast Recording (starring Elaine Paige) for $5, and have since been bitten by a The King and I bug. Over the course of the next several weeks (months? ), I will be hunting down and exploring any recording of the score I can get my hands on, film adaptations (the original 1956 classic and the 1999 animated curiosity), as well as its source (Margaret Landon’s biographical novel Anna and the King of Siam) and its film adaptations. Though a chronological exploration would make the most sense, I will probably take things in as they become available via inter-library loan and other sources. In talking about each item, I will credit all the principals, but will likely only comment on the most notable element(s) of each recording and let it be assumed that unmentioned performances were appropriate. If the 2000 London Cast Recording seems like a rather arbitrary place to begin this journey, it’s two chief attractions perhaps explain why this recording triggered this new found appreciation on my part. First, this is a notably comprehensive recording. It includes the complete 17-minutes “Small House of Uncle Thomas” ballet in addition to a few lushly underscored book-moments (the First Act Finale and Anna’s reading of The King’s final letter),allowing the recording to tell a good deal of the story and rendering it an emotionally impactful presentation of the score.